1.5 is more effecive, 1.0 will have some effect but for best results you really need 1.5. You could start with 1.0 and work your way up. And, just to be clear: This is for wrinkles around, not on the lip. The 1.0 roller does reach the dermis, but the 1.5 does it more thoroughly but hurts more too. We can't be absolutely sure because there is not enough data, which will take years to colect from many customers to be sure. People haven't been dermarolling in large numbers yet, for the past years. So purely based from literature research on the structure and properties of the skin, 1.5 would be optimal. We are out of 1.0 mm rollers at the moment (they are not in high demand) but more are on their way. > out my lip on a temporary basis. > I had this procedure done twice and the product has all gone. > upper lip which is raised and little bumpy. It is very difficult to determine what caused the bumpiness. Whether it is the result of a badly healed injection or whether some "granulation" formed under you skin as a reaction to the Restylane. I have heard that some people who had Sculptra injected, ended up with bumpy granules that formed under the skin which had to be surgically removed. "I would appreciate some feedback about the reports of "granules" forming in patients treated with Sculptra. On this site, there have been posts of people developing granules years after having been treated. Why do these granules form and how likely do they occur?" "It is a known complication of Sculptra. It was more common in the past when the material was not diluted enough and patients did not do any massage. Sculptra stimulates growth of your own collagen. If too much is deposited in one area, you have a lot of collagen concentrated in one area, which can feel like a lump, granuloma, nodule or granule." Please do not get me wrong. I am not sure whether this can happen with Restylan as well. Restylan and Sculptra are not the same. I just wanted to explain that I can't be sure what caused your bumpiness. If indeed granules were formed in the skin, then the needling cannot fix that. If the bumpiness is just scarred skin - the results of bad healing - then needling could help. > help to even out that part of the lip?? The single needle would be a better choice in this case because you can target the scar and leave out the surrounding tissue. Start very carefully with just a few pricks in the scar and you will see how it heals. In your case, since maybe your Restylane injection healed badly, I would be very careful because if you are a "bad healer", you might make the scar look worse if you overdo it and heal badly. You have to experiment and start with just a couple of pricks. If the healing goes OK, then next time do more pricks. Prick the scar at most once a month. >is there an alternative to vit-c ascorbic acid to help promote collogen? Vit. C is absolutely essential for collagen production. You cannot achieve high levels of vit. C in the skin with oral intake alone. You have to apply it externally to your skin as explained in our instructions. To apply it externally, it has to have a low pH. L-Ascorbic acid is the only form of vitamin C that is absorbed and used effectively by the skin. "Acid-free" vit. C is useless for skin absorbtion purposes - you have to use pure, acid vit. C crystals mixed with nothing else and the optimal concentration is 10% by weight. Use the vit. C serum according to our dermarolling instructions. > might I use those products, if necessary? Infadolan is not a cream, it is an ointment. Both vit. A and D are fat-soluble and that's why Infadolan is an excellent carrier for those vitamins but it is bit too oily for everyday use or if prone to clogged pores. Infadolan is a medical grade regenerative ointment that is indicated to regenerate mild skin trauma - such as first degree burns etc. It is excellent to use after needling with long needles (1 or 1.5 mm) because such needling causes a mild skin inflammation (that will trigger new collagen production) but the skin is slightly "traumatized" and needs to regenerate. Infadolan will supply vit. A and D and it will protect your skin after needling. Since you are prone to clogged pores, you should only use Infadolan just after rolling with long needles (1.0 or 1.5 mm) and 2-3 days afterwards. Use very little. Homemade vit. C serum should not be comedogenic at all as far as I know. You can use any product before you roll. After rolling with long needles, do not use anything that dries out the skin or too harsh a cleanser. A mild cleansing product is best. Make sure your cleansing products are not contaminated with bacteria. If you are not sure - buy new ones! > I roll, might I be able to resume swimming? If you roll with long needles such as 1 or 1.5 mm then I would avoid getting the face into heavily chlorinated water for at least 3 days. Avoiding the sun is a must as well. >products.You have great info and you seem very knowledgeable and trustworthy. >red and the rest are white but look quite indented. You can use Infadolan with 0.2 but Infadolan is not a cream, it is an ointment so it might be bit oily for everyday use (unless you use just a little) Both vit. A and D are fat-soluble and that's why Infadolan is an excellent carrier for those vitamins. Infadolan is a medical-grade regenerative ointment that is indicated to regenerate mild skin trauma - such as first degree burns etc. It is excellent to use after needling with long needles (1.0 mm or 1.5 mm) because such needling causes mild skin inflammation (triggering new collagen production) but the skin is slightly "traumatized" and needs to regenerate. ..and put it on your skin every second or third day. That is very important. You can put it on your skin after 0.2 mm needling provided it doesn't burn your skin (depends on how concentrated you made it). It will tingle though. >can I roll every day with the 0.2?do I have to sterilize it each time? You can roll every day but it is not necessary. The only purpose of the 0.2 mm roller is to enhance the penetration of your skin care products. You don't have to do it every day. I recommend rolling about 3 times a week with 0.2. And your roller will last longer if you do not roll every day. You do not have to sterilize the 0.2 every time but you have to wash it in dishwashing liquid and water. Once in a while you can submerge it in alcohol for 20 min. >i plan to lose weight.will the 0.2 help in preventing new stretch marks? Nobody can answer this question. Nobody knows how to reliably prevent the formation of stretchmarks. But we know that quick up or down changes in weight often trigger stretchmarks and that's why you should try to lose weight slowly and take great care to stabilize your weight. Concerning the stretchmarks - it is safer to be slightly overweight and stable than have large weight fluctuations - the well-known jojo effect. You can numb with an (improvised) ice pack. You will see how it goes with the 1.0 mm. You will get some occasional pinpoint bleeding. If you do not see any pinpoint bleeding, not even occasionally, you should opt for the 1.5 mm. The skin on the abdomen and thigh is quite thick and the stretchmarks are deep cracks in the skin. Don't roll over varicose veins. >does infadolan contain parabens or other dangerous preservatives? The ointment base is White wax, natural lanoline, white vaseline. >I live in greece.you ship here,right? Keep on rolling, you'll see solid improvement if you stick to it! > needs to go to be effective. How deep should I go? > I was thinking 1.5mm deep. What do you think? Any advice? Individual depressed scars are an ideal target for treatment with the single needle. I advise you to start with about 1 mm deep pricks and you see how it goes. Next time you can go deeper. Prick the scar from various angles. Pinpoint bleeding is OK. If you get some pinpoint bleeding it means you are in the dermis layer of the skin and that is your target. Pinpoint bleeding is the limit. Do not go deeper. Don't prick more frequently than once every month (the same scar) and be patient. You will not see any change after just one or two months. To fill the indented scar, a lot of collagen is needed and it will take a long time to achieve it but it is possible. Dermarolling / Microneedling / Why are we cheaper than Dr. Roller? > sterilized? Comparable to Dr Roller? Certainly our rollers are sterilized (Gamma sterilization) and they come in hermetically sealed plastic bags. The roller head is covered with foam to protect the needles, and the roller itself comes in a very sturdy case, so strong that you can actually stand on it without damaging the roller. After production, the rollers are subjected to quality control. We know for a fact that this quality control is real and not an empty promise and we depend on it, because the last thing we want is to get sued by people that receive a roller with bent needles that tear up their skin! Sell the absolute worst rollers for the absolute lowest price and try to get rich shifting a large volume. Some online offers that seem "too good to be true" are in that category. Sell mediocre rollers at a very large premium, using heavily search-optimized and forum-spammed sites with lots of fake testimonials and other dodgy tricks. Derma-rollers.com are in that category. Sell good rollers for a ridiculously high price, by claiming that your roller is "The only genuine original and others are dangerous". That way, you can afford expensive advertizing campaigns and a Mercedes for the CEO. Dr. Roller is in that category. Dr. Roller's dermaroller is a SE Asian "copy" of the Original Dermaroller™, patented by the Swiss Dermaroller S.a.r.l. Sell good rollers for a normal markup, and provide well-researched user instructions and solid after-care by email and forums. We are in that category. Our roller also is a similar copy of the Original Dermaroller™, patented by the Swiss Dermaroller S.a.r.l. 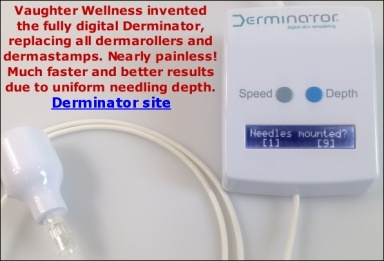 Patent the Dermaroller™ and only sell to Western clinics that you personally visit to sell the idea to them and intimidate them a little, so that you can charge a very high price, and when they refuse and use a SE Asian copy, you can easily sue them and win, and they know that, so they'll use yours. Dermaroller™ S.a.r.l. is in that category. "Our" dermaroller (a Dr. Roller clone) has been tested on my own skin, the needles are made of surgical steel, the handle doesn't bend and is ergonomical, and the roller stands up to being cleaned in hot water and alcohol. If we ever find a better roller for a similarly honest price, we'll switch to that one, so let us know when you found something better . > I'm in the US (NYC) and am thinking of buying some dermarollers from you. > chemicals on my skin. Do you suggest an alternative? exposing your skin to the sun for at least 2 days after the rolling (just like in the majority of laser treatments). You must wear a hat and use a high-factor sunscreen if you go outside. It's alright to put Zinc oxide sunblock on but not immediately after dermarolling. Applying it the day after is OK.
(However it is much better to use any sunscreen including a zinc oxide-based one right after dermarolling than going outside unprotected from the sun - you could end up with hyper pigmentation. To offset the drying effect of zinc, just apply some cream to keep the skin moisturized and put the Zinc-based sun block on top). Dermarolling triggers collagen production but rolling also temporarily compromises the protective skin barriers and the sun is very bad for your recovering skin at that vulnerable stage. Zinc oxide dehydrates the skin. Zinc oxide is a mild astringent. An astringent is a substance that shrinks and constricts body tissues. Zinc oxide acts as a skin-drying agent and can act as a skin anti-inflammatory. Astringents cause mild coagulation of skin proteins and that causes the skin to dry up. Zinc's "drying" properties are very beneficial in treating diaper rash, oily skin with acne or any other skin condition where drying the skin is desirable. After dermarolling though, the "open" skin should be kept as moisturized as possible and that's why substances with astringent and dessicating (drying) properties are not suitable. Additionally, Zinc has a mild anti-inflammatory effect and optimal collagen induction and elastin formation is achieved after the mild inflammation that rolling causes. that's the reason we roll: To cause a controlled inflammation. Zinc oxide or titanium dioxide are excellent physical sun blocks. It works by covering the epidermis and reflecting the UV rays. Another reason why you should stay away from your skin the first days is the risk of bacterial contamination. If your sunblock has been used for a while and it is not in the tube, its probably already contaminated by your hands etc. If your skin is intact it doesn't matter but you should be careful when the skin protective barrier is compromised and you should only use tubes - not jars - where the risk of contamination is very low. That's why we chose Infadolan, which is a medical grade regenerative ointment indicated for first degree burns. Nobody can guarantee results, also not of any in-office treatment. There are people that underwent several in-office dermarolling sessions for their acne scars and they got disappointing results and there are people who roll themselves at home and they got good results. It depends on so many factors that we can safely say that a well-informed home-roller can get better results than a mediocre clinic can. Clinics are under time pressure and are there in the first place to make money (= getting you to return as often and as long as possible). You can try to roll yourself and if you get no results, try in-office treatment. Either way, it is unrealistic to expect results too soon. Dermarolling / Microneedling / New to dermarolling. It's indeed correct that you should wait at least three weeks in between rolling the same skin with a 1.5 mm dermaroller. It is normal that stretchmarks or scars first look worse before they look better. All kinds of processes happen in the skin, after rolling. Discoloration, peeling, swelling, creation of new skin cells, increased blood flow, mild inflammatory reaction etc. I can reassure you that unless you have a very rare genetic skin disorder (easy scarring), your marks will look better or at least the same after about ten days to two weeks. So don't despair. Wait four weeks now, and let us know here how the look of your marks is improving in the meantime. A 1.5 mm roller is a powerful, but "invasive" medical instrument and therefore, plastic surgeons warn people not to use it for home-rolling, exactly because there is so much conflicting advice on the Internet on how often one should roll, how one should roll, what creams to use etc. So by all means use a 1.5 mm roller, but use it wisely.. It takes a lot of patience due to the requirement of only-once-a-month but it gets at the skin layers that need to be stimulated and therefore it really works. Those thousands of pricks first need to heal, then new collagen and elastin needs to grow, and when everything is 100% healed and regenerated, you can start the process again. In between, you can roll with a 0.2 mm roller, to enhance skincare products penetration. The months will finally have passed and you will see great results, but expect to wait ten months to be able to say: "Wow - do you see the difference with the photo ten months ago!". Of course we have a commercial enterprise, but we're not looking to get rich. No hype from us, no quick results, no dozens of fake testimonials either. Our advice is based on digging through medical literature (we will post links on this forum to all kinds of publications soon, however be advised that it is tedious stuff). About the cream: I of course advise to use our ointment. An ointment is oil-based and occludes the skin after rolling (occlusion means preventing oxygen - a potent oxidant - from entering and preventing moisture - that keeps the cells alive - from escaping). This is very important, after rolling. Apart from being occlusive, our ointment contains a good form of vit. A for dermarolling aftercare. Not the too acidic Retinoic Acid, but Retinol Acetate. That makes our ointment suitable for use against first degree burns. Open skin should not be exposed to acids - as we know, acids etch away living tissue! Derma-rollers.com gives extremely bad advice - they recommend rolling three times a week with a 1.5 mm ("Scientia") roller. This will do more damage than good because it will keep your skin in a state of permanent inflammation. Other sites even advise to roll 5 times a week with a 1.5 mm roller. Their "endorsements" and "reviews" are hysterically positive and full of obvious untruths (stretchmarks virtually disappearing after one week, etc.) and do not appear genuine at all, but the main thing is that they make our advice look wrong, while they're giving dermarolling a bad name by doing harm to their customers. They're a SE Asian company and surely won't be held accountable for damages. Judging from the way they set up their site (extremely search engine optimized and very commercial), they have more knowledge of commerce than of micro-needling. Feel free to buy their rollers, but do not use a 1.5 mm roller more than once every three weeks. Please consider that if we would prioritize our sales volume over our customer's skin health, that we would also recommend multiple rollings a week with a 1.5 mm roller, as the roller will blunt 25 times faster and we would thus sell 25 times more rollers. 5 x a week vs. 1 x per 5 weeks is twenty-five times more profit. If you roll three times a week with a 1.5 mm roller, your "results" will be due to a state of permanent swelling. When rolling with needles longer than 0.5 mm, rolling more frequently is certainly not better than rolling less frequently, on the contrary! Collagen production is a very slow and long process. There are several complex, intermediary stages in collagen production. Collagen formation goes though long intermediate phases from Collagen III and finally Collagen I. When you roll your skin with any needles that reach the dermis, collagen production can certainly not be completed in three days. It hardly even has started after three days. Its actually not even completed in five weeks but at least the first stages are completed. You should not roll before the skin is completely healed from the previous rolling. If you roll every three days with long needles (such as 1.5 mm), your skin will be in a state of permanent inflammation and swelling. It will look great because your wrinkles will be less visible due to that swelling but don't confuse this effect with permanent results! Its a deceiving, short-term "trick" and being in a permanent state of inflammation will damage your skin in the long term. Permanent inflammation is not a good idea at all. There is no reason to disturb the formation of new collagen that is not even remotely completed by pricking the skin again and again before the damage of the previous rolling is healed and collagen production completed. You can roll several times a week with short needles (0.2 or 0.5). Dermarolling / Microneedling / What needle length dermaroller for turkey neck? > 1.5mm or 1mm needle length. A dermaroller cannot fix significantly sagging skin, but itr can improve the skin texture and mild skin laxity. However, if there is serious excess skin on your neck, then you need a necklift. If your skin is only mildly lax then use a 1 mm dermaroller (every two weeks) and apply some tightening creams right after rolling. Dermarolling highly enhances the absorption of any skin products, so that should be a good combo. If rolling is too painful for you, you can numb it with an icepack or buy a numbing cream such as EMLA. We sell EMLA or you can buy it OTC. Pricking the skin with needles will trigger your own collagen production and that collagen will stay. Contrary to fillers such as Restylane that people get injected by a doctor to fill their wrinkles. Those fillers have an immediate effect but our body slowly eliminates them - that's why they have to be re-injected all the time. If you manage to produce your own collagen by dermarolling, it will stay. If you get some "hollow" places on your face caused by receding fat - as we age we are losing fat from our skin - a dermaroller cannot fix it. Then you really need some fillers to be injected to the hollow areas where the fat has gone missing - such as under the eyes. > the entire face. I just go in one direction at a time for the whole face. > Should I do a little area at a time instead? It doesn't really matter. You should roll in a way that it is comfortable to you. If you can take the pain of rolling your entire face then roll your entire face. The problem with acne scars is that they are usually quite deep and that's why you have to use long needles and go deep. It will take a long time to achieve results. Another problem that can occur with dermarolling scars is that it exposes some semi-hidden acne scars that were below the skin and they were not so visible because there was a small skin layer covering them. But the scar was there and the skin was uneven. Dermarolling uncovered those hidden scars because the dermaroller exposed the scar underneath. Lots of people report that their acne-scarred skin actually looked worse after several initial rollings because all those "hidden" scars were exposed. But that was the first step to improve the scars. Later their scars improved significantly by dermarolling, especially when vit. A was applied. Infadolan is a medical grade, regenerative, protective ointment with vitamins A+D and Lanolin. There are several reasons why we chose INFADOLAN. First of all some other A+D ointments contain Zinc oxide, which is a mild astringent. An astringent is a chemical substance that shrinks and constricts body tissues. Zinc oxide acts as a skin-drying agent and can act as a skin anti-inflammatory. Astringents cause mild coagulation of skin proteins and that causes the skin to dry up. Zinc's "drying" properties are very beneficial in treating diaper rash, oily skin with acne or any other skin condition where drying the skin is desirable. Zinc oxide is also an excellent sun protection because it reflects the UV rays. After dermarolling though, the "open" skin should be kept as moisturized as possible and that's why substances with astringent and dessicating (drying) properties are not suitable. Secondly, some A + D ointments contain a strong antinflammatory ingredient and which should not be put on your skin after rolling. The reason is that the dermaroller basically causes a mild, controlled inflammation of your skin, that inflammation triggers certain responses in the skin such as collagen induction and that's why a mild inflammation is desirable and should not be suppressed with strong anti inflammatory ingredients. The third reason is that Infadolan contains Lanolin, which is a very good occlusive and an outstanding moisturizer. It is especially useful to occlude the scars with an occlusive ointment after dermarolling scars, to postpone peeling. For reasons we do not fully understand, the occlusion of the scars has been proven to be beneficial in medical trials. Our ointment contains natural Lanolin. The Lanolin carries the vit. D into the skin. The forth reason was that our ointment contains a high enough percentage of vit. A to have a therapeutic effect and that vit. A is there in the form that doesn't irritate the skin when the skin is "open". Infadolan is therefore used to treat first degree burns. Ordinary "Retin A" (Retinoic Acid) is not a good way to bring vit. A into open skin, because it is acidic. Infadolan contains Retinol Acetate, which is a non-acidic form of vit. A that does not "burn" the skin. The Retinoic acetate is slowly converted to Retinoic acid inside the skin. This process is much better for "open" skin than applying Retinoic acid directly. The ointment base is white wax, natural lanolin and white vaseline. Some people have reservations about using Lanolin or Vaseline, but all we can say that Lanolin is God's/evolution's ultimate natural skin care product and that it, as well as vaseline, are excellent occlusives. Occlusives prevent natural skin moisture from escaping. This moisture is essential for the healing process after dermarolling. Vaseline is not "made of gasoline" - Vaseline is just as natural as the oil that comes out of the ground. Vaseline is made of oil, and oil is widely assumed to be made of ancient dead sea organisms. Contrary to what some believe, Lanolin allergy does not exist at all or occurs at most in one in a hundred thousand people. Sometimes the good old skin products really still are the best. No need for gimmicks here. This cream is prescribed for first degree burns in its country of origin, the Czech Republic. If we knew a better ointment, we would sell that one. The issue is that it has to be an ointment (= having an oil basis, to prevent the tissue in the skin from getting micro-damaged due to oxygen exposure and drying out. That would interfere with optimal collagen/elastin formation). This ointment is so far the very best we managed to find, with no reported issues - on the contrary, people like the soothing coolness without subsequent irritation. The only drawback is the oiliness, but if you want to be pretty, you have to suffer.. The key is to use very little. As it is oil-based, you need very much less than if it were a cream. A skin needled with long needles should be treated with caution. You should not use anything that can easily become bacterially contaminated, such as a jar that you had repeatedly put fingers in, etc. Infadolan is in a tube and that ensures no bacterial contamination. Infadolan contains no alcohol and no parabens. Dermarolling / Microneedling / When and how often to use vitamin C? > while I am rolling? Everyday in the morning, perhaps? Vitamin C stays in your skin for up to 70 hours so you do not have to apply it every day. You can apply it ever other day. You can even try to apply vit. C serum after rolling with a 0.2 mm dermaroller but do it only if it is not irritating your skin. Vit. C is very good for the skin but it is an acid and if your vit. C solution ("serum") is of a high concentration then it can irritate the skin. You have to try. Before rolling with a 1.5 mm dermaroller, apply vit. C for three consecutive days to achieve maximum concentration. You can even apply a few hours before rolling. Vit. C is light sensitive an should be applied in the evening. > stick to using the single needle monthly? If you are using a 0.5 mm roller you can roll twice a week, even the scars that were recently single-needled. Do not use a dermaroller if you still have scabs from needling. Do not pick on the scabs - it could cause scarring. Let them fall off naturally. It is not necessary to roll on a scar that was recently needled with a single needle. Unless you want to use it for product-penetration into the scar. It is different if you have a large area covered with stretchmarks, for example. There you should regularly roll the entire area with a dermaroller, but use a single needle only on the stretchmarks.